Many have experienced that pupils have been plagued and bullied in schools and dormitories. And the responsible were both other children, teachers and employees in the boarding schools. 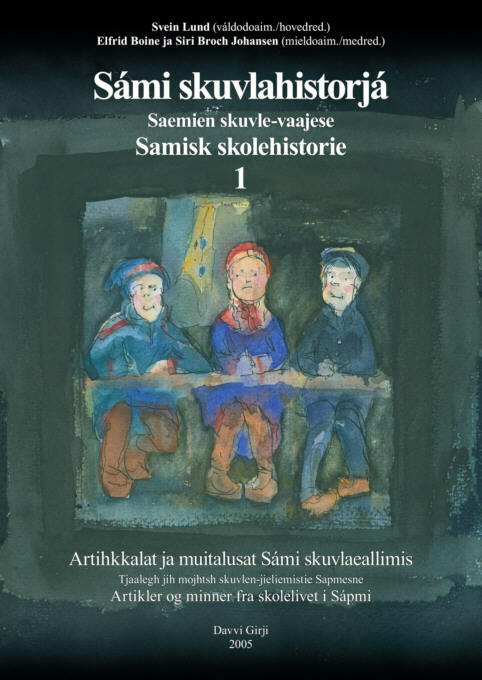 In her book Bortsendt og internert, Ingjerd Tjelle has documented that both Sami, Kven (people of Finnish descent) and Norwegian children have suffered. In addition to what children from all the people have experienced, many Sami children have also been plagued due to their Sami language, culture or clothes. Larine Johnsen tells from Hasvik boarding school, where she was a pupil from 1934. 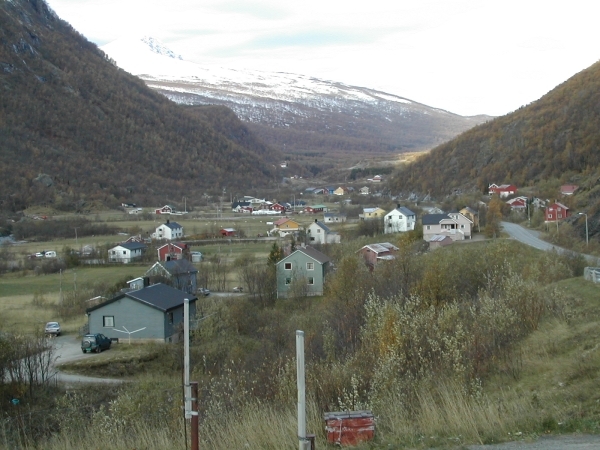 – Both in Hasvik and in the school many people disdained us who came from the fjords, because we were not able to speak Norwegian completely correct. They called us «Øyfjord-lapps». There were often quarrels and fights between the children from Hasvik and the children from the fjords, and the children who were Norwegian, or thought they were Norwegian, teased the Sami children. I remember that they cut off the tips of my komags (traditional Sami footwear). I hade quite long hair, but once some of the Norwegian children cut off my hair with force. 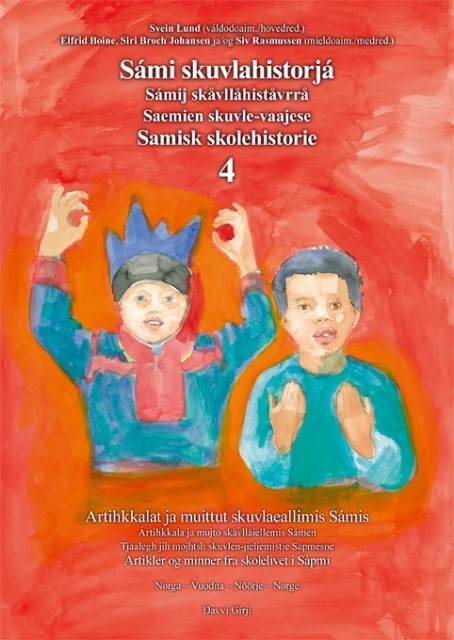 The bullying of Sami children did not end with Larine's generation. Her eldest dauhgter, who was born in 1950, knew more Sami than Norwegian when she started school. But they bullied her in such a way that she quit speaking Sami afterwards. The younger ones grew up with Norwegian as their dominant mother tongue. But their Norwegian was influenced by the poor Norwegian of their parents, and «et glass» (a glass) turned into «en klass» etc. – Other children bullied us a lot because of our poor Norwegian. The worst ones were maybe those who came from a Sami background themselves, and were trying to escape it. It continued like this for a long time, it was still like this until the 1960- and 70's. Once when we were playing with other children, a mother came running after us with a big plank and chased us while she was screaming: – Lapp-children (Sami children), go home, you are not allowed to play with our children! That is how we learned that we were worth nothing. 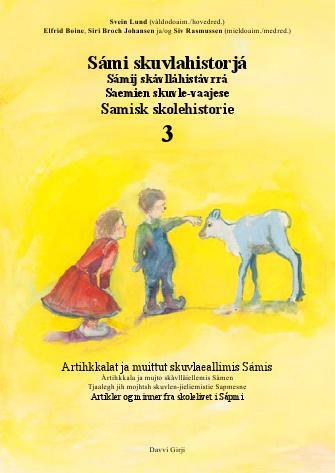 Both children and grown ups were bullying Sami children. The teachers must have known that they were bullying us, but they did nothing about it. 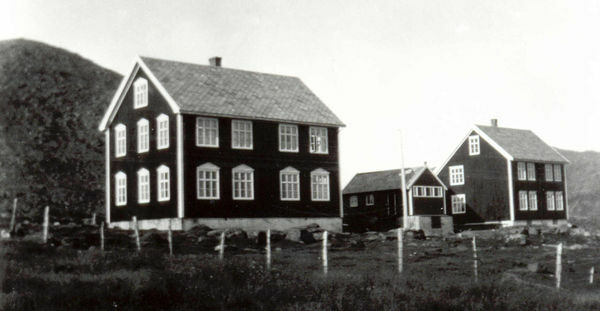 Hasvik school around 1930. The school is to the left and the dormitory to the right in the picture. Ebba Westerfjell attended first grade in Havika Sami school, but the school was closed when the war began, and she continued her schooling in Majavatn. - It was the children, not the teachers which was the problem. One should not complain to the teachers. They were not so much out in the yard that they saw what was happening. I remember once we had had a test in Norwegian language. The teacher said to the class: "It is a great shame. Ebba speaks Sami at home and she is more clever in Norwegian than you." That he should never have said. That break afterwards became terrible. It was so bad that they never used my name, only words of abuse. What they said - no, it was so dirty words that I don't want to say them. One matter was the problems with bullying from the other children. But the treatment I got from the teacher was not much better. There was no understanding for the fact that I had a different linguistic background to the others. Among others, we had a teacher who was only about 20 years old. I do not know what kind of education he had, but it can not have been much. I was actually quite good in Norwegian, in many ways I had learned more than many others in the school where we were evacuated. I could write, both composition and dictations. The problem was that I could only write in New Norwegian, and that was not accepted. The teacher did not know New Norwegian, and when he read out loud what I had written, there was always laughter in the class. I remember I once wrote: «Eg sykla etter vegen» (I cycled along the road). The teacher read out loud: «Eg sykla etter veggen» (I cycled along the wall). He wanted to remove allof my New Norwegian, with the result that my entire exercise book became full of red lines. To survive in class I had to make myself more stupid than I was, I set myself back to the level of a 7-8 year old. I was put into an excepeptional position in the class because I was «stupid». With the result that I was made to draw letters as a punishment. I was also threatened with being sent to a special school. There was no disciplin in the class, since the teacher was not much older than we were, and never descended on pupils who teased and bullied each other. Randi Nymo, from Skånland, tells what elderly people in that area have experienced in school. In a letter to the editor, Alfon Andersen from Boltås / Vatnjavárri in Skånland has told about his first year of school in 1946. He and his twin-brother Harald did not know any Norwegian when they started school. They were hit on their hands with the ruler if they had been speaking Sami in the break. Some children were pulled by the hair. Alfon says: "We small fries learned fast, both due to hard blows on small children's hands and fierce pulling of the hair, we quickly quit speaking Sami". Niillas A. Somby started school in 1955 and attended school alternately in Vestertana and Polmak. - In Vestertana I had to take the dog and the big-knife when I went to school, otherwise I would not have managed there, at least not the first years. I tied the dog to the telegraph pole, and I also hid the big, old, rusty knife there. ... To arrive at school in Gárggogeahči we cycled from the head of the fjord in Vestertana, a ride of two kilometres, each on our own bicycle. I always had to go a little bit after the others, because I could not arrive at school before the schoolmistress had rung the cowbell to get the children in to the classroom. When the others went inside, I arrived with my bicycle and the old dog on a lead, heading towards the telegraph pole. I tied the dog and ran inside. In the breaks I had to be the first one to go outside and run to the pole. No one dared to come near the pole, because I had told them that the dog was very dangerous. 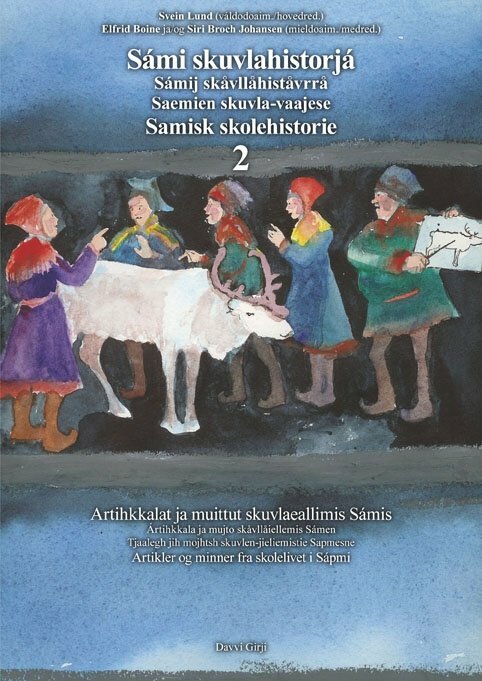 ... - "Fjellfinngubben, fjellfinngubben" (Mountain Lapp geezer, reindeer herding Sami), the children who lived in the dormitory used to yell. They came from places along the coast such as Stáhpogieddi, Lávvonjárga, Gohppi and Gávesluokta. I knew the children from Vestertana, there were never any fights with them. After all we had grown up together. And in addition most of them were relatives, descendants of Lásse Jussá, the cousin of my deceased grandfather Ivar. But in the school yard none of them dared to defend me. 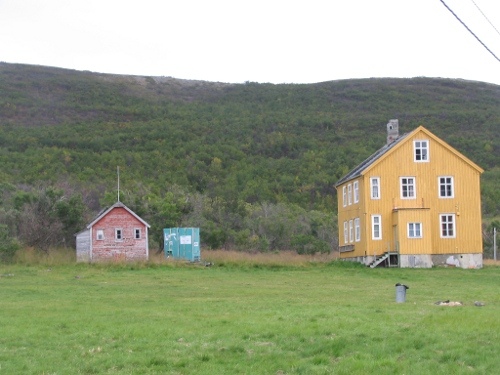 Vestertana dormitory is the only dormitory building in Finnmark which still is left as it was before the war. It was school there in the period 1934-63. A summary based on many stories and sources. Many of the ones who went to school in the 1950-, 60- and 70's have difficulties speaking about it. Above all the ones who had bigger problems during their schooling. The ones who managed better are the ones who are able to tell something about it in retrospect. 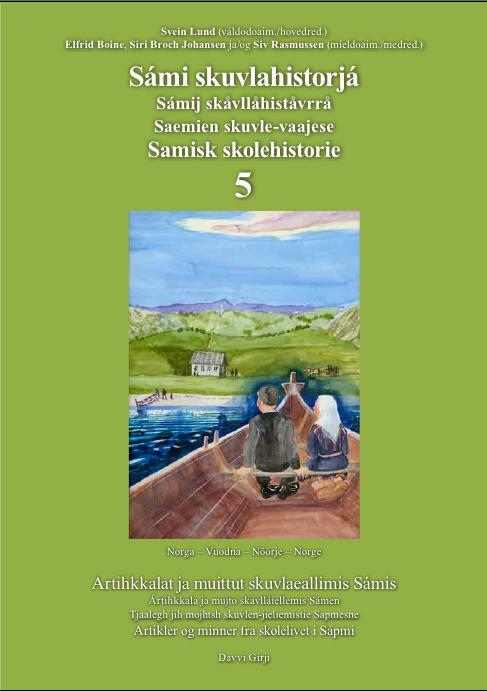 They say that in the 50's and 60's one experienced assaults on Sami pupils every single day. It was both from teachers and other pupils, and it could take the form of naming and bullying, or that they simply were overlooked and given a cold shoulder. The few who were good in school were not plagued directly, but one of them tells that it hurt just as much to see how her relatives and neighbors were harassed. The Sami in Spansdalen live quite concentrated. In this area there was little earth for each farm in the time when everybody tried to make a living from agriculture. It was common that the teachers simply gave up the children from Spansdalen. There was not made any demands to the children from Spansdalen, they were not asked when there were recitations of homework in class, and they were left playing with putty when the other children in the class learned numbers and letters. When you ask people from Spansdalen about how the bullying in school took place, it can be difficult to get clear examples, maybe most of all because many have tried to repress the memories of that time. But this is at least one case: The headmaster had made a tape recording with an old woman from Spansdalen, who spoke very poor Norwegian. Afterwards he placed the tape recorder on the desk of a pupil from Spansdalen and played the tape back for the class, while he was laughing openly. In the same newspaper the headmaster Terje Karlsen has also been interviewed. He declares that «No bullying is taking place at Lavangen central school today, neither of children from Spansdalen nor of others».